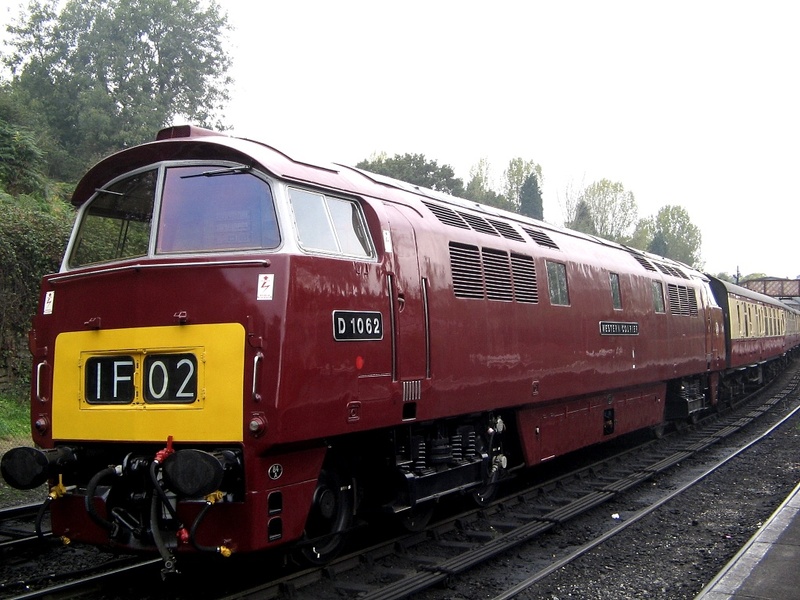 over this coming May Bank Holiday weekend at the Severn Valley Railway , Western class 52 diesel no D1062 Western Courier will be operating together with Warship class D821 Greyhound on Saturday 4th May and Sunday 5th May 2013 to celebrate 50 years since first entering service. In additionWestern class 52 no 1015 Western Champion will also be operating for the return of the beer excursion. There will also be steam hauled trains in operation over the Weekend. D1062 Western Courier first entered service on 6th may 1963 and was one of 74 class 52 Diesel Hydraulic Western Class locomotives which were originally built at Swindon and Crewe by the Western Region. They were to be named, and the names all began with ‘Western’. The second of the two words were emotive and evocative words, resulting in such names as Western Enterprise, Western Pioneer, Western Campaigner, Western Challenger, Western Champion, Western Ambassador’ and Western Glory.The Western Region chose a mainly diesel-hydraulic design path, drawing considerably on the experience of German railways. Built between 1962 and 1964 ,British Rail (BR) assigned Class 52 to the class of 74 large Type 4 2,700hp diesel-hydraulic locomotives built for the Western Region of British Railways between 1961 and 1964. All were given two-word names, the first word being Western; thus the type became known as WesternsSadly most were withdrawn between 1973 and 1977, Western Champion, 1013 Western Ranger, Western Lady and 1062 Western Courier are among the few that are left and it seems amazing to think that they have now spent longer in Preservation running on Heritage Lines than they did in active service and judging by the popularity of the ‘Westerns’ during their last years of service they enjoy almost a cult following..
Often referred to as the Godfather of Soul, the late great American singer, songwriter, arranger, and dancer, James Brown was born on this date May 3rd, 1933 in Barnwell, South Carolina. He was a prolific singer, songwriter and bandleader and became one of the most iconic mportant and influential figures in funk and soul music from 1956-2006. This remarkable achievements earned him the sobriquet “the Hardest-Working Man in Show Business” and helped him become one of the most popular entertainers in 20th-century popular music. Among his most popular songs are “It’s A Man’s World” “Try Me” “Night Train” “Please, Please, Please” “Papa’s Got a Brand New Bag” “I Got You (I Feel Good)” “Cold Sweat ” “Say It Loud—I’m Black and I’m Proud” “Get on Up” and “Super BadBrown was raised mainly in Augusta,Georgia, by his great-aunt, who took him in at about the age of five after his parents divorced. Growing up in the segregated South during the Great Depression of the 1930s, Brown had a really impoverished upbringing and this probably explained his later penchant for wearing ermine coats, velour jumpsuits, elaborate capes, and conspicuous gold jewellry. Neighbours taught him how to play drums, piano, and guitar, and he learned about gospel music in churches and at tent revivals, where preachers would scream, yell, stomp their feet, and fall to their knees during sermons to provoke responses from the congregation. Brown sang for his classmates and competed in local talent shows.At age 15 Brown was sentenced to 8 to 16 years in prison after being arrested for breaking into cars but was released after 3 years for good behaviour. In the 1970s Brown became “the Godfather of Soul,” and his hit songs stimulated several dance crazes and were featured on the sound tracks of a number of “blaxploitation” films. When hip-hop emerged as a viable commercial music in the 1980s, Brown’s songs again assumed centre stage as hip-hop disc jockeys frequently incorporated samples from his records. He also appeared in several motion pictures, including The Blues Brothers and Rocky IV, and attained global status as a celebrity, especially in Africa,where his tours attracted enormous crowds and generated a broad range of new musical fusions.Brown’s uncanny ability to sing soulful slow ballads as well as electrifying up-tempo tunes, often blending blues, gospel, jazz, and country vocal styles together, made him one of the most influential vocalists of the 20th century. His extraordinary dance routines featuring acrobatic leaps, full-impact knee landings, complex rhythmic patterns, dazzling footwork, dramatic entrances, and melodramatic exits redefined public performance within popular music and inspired generations of imitators. The musicians associated with him (Jimmy Nolan, Bootsy Collins, Fred Wesley, and Maceo Parker) have also played an important role in funk music. in 1986 Brown was inducted into the Rock and Roll Hall of Fame for his outstanding contribution to the world of Funk and Soul Music .Brown sadly passed away on December 25th 2006 but he made such an outstanding contribution to the world of Funk and Soul Music that he will not be forgotten and his legacy will live on for many years to come.